An Amish teen in the New Wilmington, PA community has been charged with a DUI after registering a 0.47 blood alcohol level. His buggy got into a fender-bender with an SUV, leading to the charges. Police in a criminal complaint reported that the teen admitted at the scene to having had a few drinks on his way to a wedding. Officers said two empty beer cans were inside the buggy. Alcohol consumption is a problem in some Amish communities, and drugs are present in some as well. To their credit, Amish parents and leaders in certain places are trying to address these issues. To give two examples, Amish in Indiana not too long ago invited an anti-heroin campaigner in to speak to their community, while Geauga County Amish bishops also invited police to address drug use and underage drinking at an event attended by 200 Amish. No doubt this arrest will bring a lot of shame to this fellow and his family. 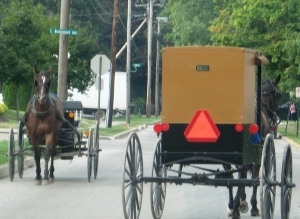 This certainly isn’t the first time a buggy driver DUI has happened; I point this out not to draw speical attention to this individual, but to note that the Amish certainly aren’t perfect and have their own challenges, which in some communities are greater than in others. We’ve looked at buggy safety on many occasions on this site. It is worth keeping in mind that while English car drivers are often the ones at fault, Amish people are not perfect and have a part to play as well, something which I have no doubt most would acknowledge. I can’t remember who it was that said it’s not news if a dog bites a man, but it is news if a man bites a dog. The points are well taken. Amish people are not perfect in spite of the often romanticized notion they are somehow supposed to be. To their credit, they do, as a society, try to address issues in their communities. Our challenge is–and probably always will be–managing the way our societies mesh instead of believing they clash. Well said Walter. We all seek a community that is problem free. Unfortunately it doesn’t exist. None of us are perfect therefore our human communities are not perfect. Well put Walter. I wouldn’t expect a media frenzy though I understand the concern (not a novel story as this isn’t the first news piece like it…just Google “Amish buggy DUI” for other examples, including from this same community). More of the stories seem to concern teenage/Rumspringa-age Amish, tough some Amish communities in general have a reputation for alcohol consumption, including among adults. What happened to the horse? and was he ok? I didn’t see anything in the article about the horse. These articles often mention if the horse does not survive, and as the car is described as having “front fender damage”. So I’m guessing the horse is okay, I would guess it was more something like him swiping the fender rather than plowing into the car head-on. Just wondering if Amish “singings” for young people might be a place where this issue (DUI, drinking among Amish “youngie”) could be brought up, if not, say, in 8th grade classes before graduation. Where else (besides home) could Amish teens or pre-teens “be informed” about these problems? I know about the Indiana program, but does it always have to be “by invitation” to have officials or even the medical community informing Amish youth about drinking and driving? First, I want to say I’ve been enjoying the Amish America site for several year, although I’ve never commented before. Thanks so much, Erik, for all the information and entertainment you provide to so many people, including “lurkers” like me. Second, on the serious article shared here: if the blood-alcohol concentration (BAC) reported is correct, it is unfortunately newsworthy in itself, aside from the person’s Amish identity. In fact, I have to wonder if the reporter made a mistake, since a level of 0.47 would be fatal for most people. It’s hard to believe that a minor, especially, would be conscious with that BAC, much less driving a buggy. To put it another way, 0.47 is almost 6 times the legal limit of 0.08 BAC for PA drivers. In any case, I sincerely hope this young person gets help! Thanks Marianne! And I’m glad you dropped in to comment. Yes that seemed off the charts to me too, considering that .08 is the legal limit in many places. And if it were a matter of a decimal point being off, then a .047 reading would not qualify as a DUI, unless perhaps the law considers any level of alcohol in the test results of an underage driver to be a DUI. That’s the only thing I can think of.